This is a handwritten one page letter from Leopoldo (Leo) Mascioli to his son, Daniel Mascioli. Dated January 27, 1941. 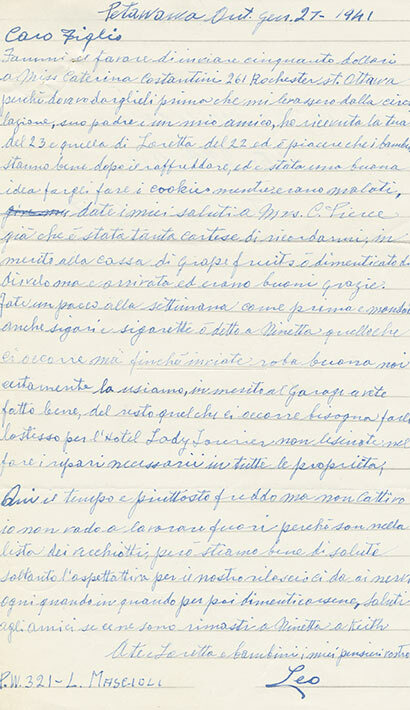 Written in blue ink on lined paper and in Italian. Leo tells his son to send $50 to a Miss Catarina Constantini in Ottawa, because he owed it to her before he was arrested and interned. He also sends his regards to a Mrs. C. Pierce who sent him a case of grapefruit. He asks Dan to send him more cigars and cigarettes in the next care package. Regarding business affairs, he reminds Dan to do the necessary repairs in all of their properties. He says that it's cold in Petawawa but that he doesn't work outside because he's on the seniors' list. "I'm only waiting for our release and it gets to our nerves. With a bit of time, we just forget about it. Hello to our friends if there are any left...."